We all know that only 2.5% of water on our planet is fresh water, indeed water is considered as a scarce resource around the entire world. In Hong Kong, 70 to 80% of fresh water consumed comes from Dongjiang water; a long-termed mutual agreement between Hong Kong and Guangdong government has secured the water supplies to meet our needs. Despite the fact that our water supplies seem to be sufficient today, maintaining sustainable and reliable water supplies in the future remains a big challenge. Cities where the Dongjiang flows through are undergoing rapid development, in addition to urbanization and increasing population, increasing industrial activities will also raise the demands for water and degrade the water quality. 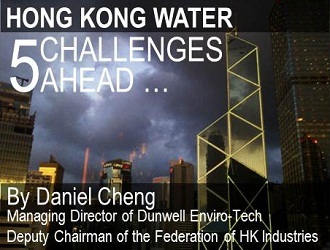 We must be aware that the future water supplies from Dongjiang to Hong Kong may not be as sustainable as the current extent; hence, preparing for the worst is never too late. Below are five opportunities as well as challenges that Hong Kong will need to address looking forward. It’s forecast that the Hong Kong population will increase to 8.4 million by 2030. As such, demands for water are expected to grow significantly. Education undoubtedly plays a significant role to nurture both our current and future generation to ensure that all of us learn about the concept of water conservation. If everyone can put words into actions, thereby develop water saving habits, the efficiency and effectiveness will be increased. Using seawater for toilet flushing has been viewed as a great opportunity and possible solution to reduce water consumption. Although 80% of Hong Kong residents are currently using seawater for toilet flushing, there is still 82 million cubic meters of fresh water being used for toilet flushing by the remaining 20%, annually. The challenge however, is that building and maintenance costs of seawater flushing facilities and related infrastructure remain high, including pumping stations and the replacement of remaining existing pipes to uPVC pipes which are resistant to erosion caused by high salt content. We should include water recycling facilities in the design and planning phase of new infrastructure and new towns. Reuse treated water with the latest technologies in sewage treatment for toilet flushing and irrigation can reduce the burden on both seawater and fresh water. Hong Kong has over 100 of such systems successfully in use already in rural areas where sewage drainage is not connected. In Hong Kong, water management has been appointed to two government departments, Water Supplies Department and Drainage Services Department. Each of them has its own specific tasks, duties, and responsibilities. By contrast in China, the Ministry of Water Resources is in charge of the management of all water resources throughout the country. Water supply and drainage should be combined into one department so as to centrally manage and utilize all existing water resources using a holistic approach. To better reduce future water consumption, we should incorporate more water efficient planning in buildings that are newly designed and will be out base for the future. This infrastructure should amongst others include water recycling systems, water systems with minimal pressure, choice of water efficient products and prevention of leakage in plumbing system. By relying now on the stable and low-priced import of Dongjiang water, we do not have to experience frequent water restrictions such as those days back in the 1960s to 1980s. But, we still have to think of the future, confront the issue and be provident. Treasuring water is our responsibility; we need to plan carefully to assure these resource for future generations against increasing demand of our neighbours in the Pearl River Delta region. Debra heads the China Water Risk team. She was tasked with taking The Asia Water Project pilot to the next level and was responsible for the direction and build out of China Water Risk portal for ADM Capital Foundation. Debra started her career in finance, spending over a decade as a chartered accountant and investment banker. She has lived and worked in Beijing, HK, KL, London, New York and Singapore. Debra left banking to explore her creative side. She has since pursued her interest in photography and within a year had her first solo exhibition sponsored by a global bank. She also ran and organized hands-on philanthropic and luxury holidays for a small but global private members travel network and applied her auditing, financing and photography skills in the field for various charitable organizations and foundations. Debra believes that we can all make a difference, if only we see the ‘big picture’. China Water Woes: The End of Fast Fashion?